TEi Limited – “Going for Gold” Safety Initiative. 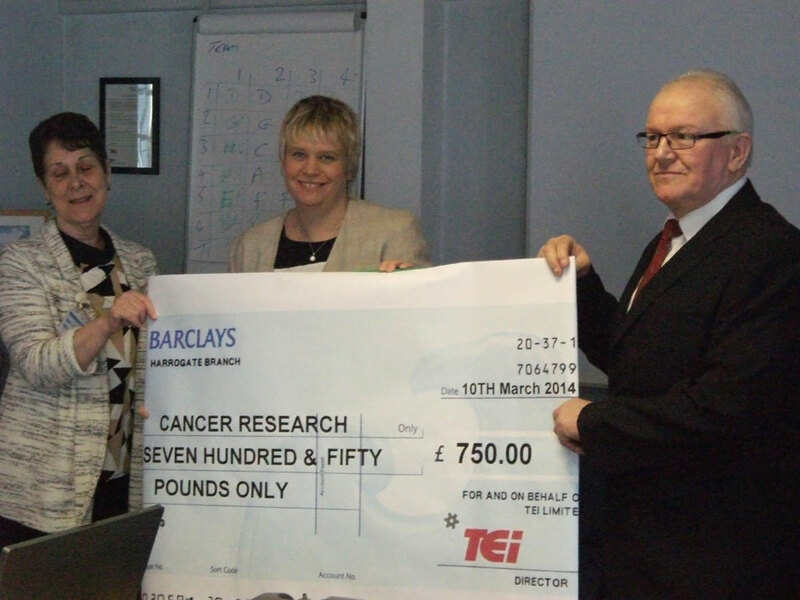 Steve Guest of TEi presenting a cheque to Cancer Research UK, Castleford Branch members at the recent Annual Safety Group review meeting at Head Office – Wakefield. Steve was nominated to represent all those TEi craftsmen who had scored a Gold Medal (≥19/20) from their Going for Gold job freeze with a Safety Advisor over the year. A total of 160 craftsmen undertook the questionnaire and where they scored highly were asked to nominate a charity of their choice. A majority nominated Cancer Research UK and the company supported this with a donation of £750. The average score of all craftsmen was 18.5/20 – a great reflection on the high level of health and safety knowledge of this group of employees. Congratulations to Steve and all those who proved themselves in terms of their understanding of health and safety requirements at the time of their job freeze – by their efforts in health and safety, others, less fortunate, will benefit.